In many countries especially those with past Spanish links, some Roman Catholic believers still follow the old medieval practice of painful and bloody self-penitence to atone for their sins. The town of Taxco, Mexico is perhaps the most famous for this ritual which takes place every year during the Easter week, where the repenting sinners known as "Penitentes" walk through cobbled winding streets of the old town. The Penitentes always wear black dress and their head is also fully covered with black hood with small openings for eyes. The Penitentes are further categorised by the method of penance. 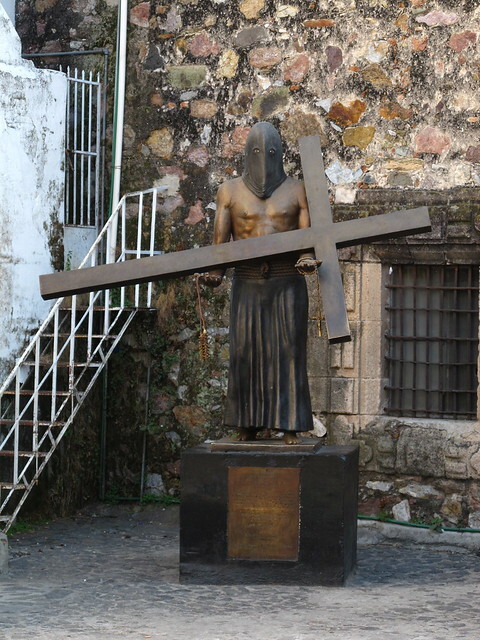 "Penitentes Flagelante" are those who walk the route shirtless and carry a large, heavy wooden cross in their arms. They carry a rosary and a whip with thorny metallic end in their hands. They frequently stop during the procession, give the heavy cross to attendees who accompany them and then flagellate (whip) their backs. This is repeated every night during Holy Week reopening the wounds of the earlier day. 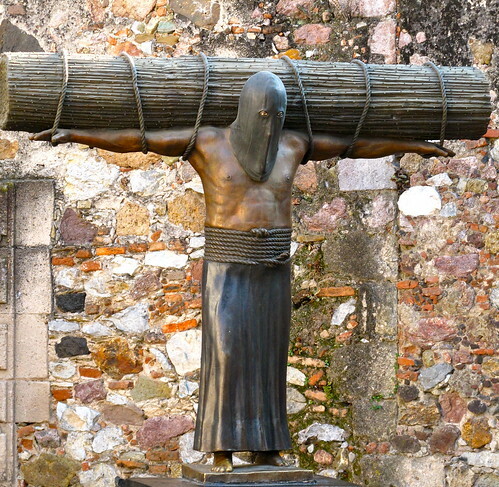 "Penitentes Encruzado" are those who instead of the cross, carry a heavy bundle (40-50 kg.) of thorned blackberry canes which is tied across their bare back and outstretched arms. They are also helped by attendees who occasionally give support to the thorny bundle when the procession is not moving. "Animas Penitentes" wear full black dress covering their whole body and also cover their head with hood. They have heavy chains attached to their ankles and walk in stooped bent posture carrying small crosses or lighted candles. As they always face the ground, these penitentes have attendants who guide them during the procession. When the procession stops, they are allowed to rest only by going down on hands and knees. The last category is the only category in which women also take part. To honour the Repenting Sinners, three statues, representing each category of the penitentes, have been installed behind the oldest monastery in the town - The ex-monastery of San Bernardino de Siena, constructed at the end of the 16th century.